The Legal Genealogist is in high cotton right now with the announcement by the Law Library of Congress of its new Federal Courts Web Archive. Yeah, yeah, I know, I’m a law geek. But I expect it’ll get better, and as it gets bigger and more comprehensive, particularly with historical content, it’s going to be better and better as not only a legal resource but a genealogical resource. Because — no surprise here — our folks tend to get themselves into federal court records. And we haven’t done reasonably exhaustive research into our families until we’ve examined that possibility as well as all the other records we look at, like land and tax and probate and vital records. At every level of federal court, the records — the court documents and the published opinions — can give us a view of the affected families we couldn’t get any other way. One of my favorite examples of this is a U.S. Supreme Court case decided in 1820. Now most people might not think of U.S. Supreme Court cases as having all that much genealogical information, since these are cases involving the highest level legal issues in the nation. Hugh Stevenson had served in the Revolutionary War as an officer from Virginia. Before he served, he had had a … um … how to put this exactly … uh … a relationship with one Ann Whaley, who had born him a whole bunch of children out of wedlock. Hugh finally married Ann in July of 1776, but died in August of 1776 when Ann was pregnant with their last child, Richard, born after Hugh’s death. Hugh’s will recognized all of his children and Ann as their mother. Because Hugh had been a colonel of the Virginia line, his bounty land amounted to nearly 6,667 acres of land, and the bounty land was granted to that one after-born child, Richard. Ann died before Richard, but Richard only lived to age 20, and died unmarried with no children. Here’s the issue: could Richard’s older brothers and sisters claim that bounty land? There’s simply an amazing amount of genealogical data in so many cases like Stevenson’s Heirs v. Sullivant, and — eventually, as more and more historical materials are added — Federal Courts Web Archive should take us to many of these resources. In the meantime, there are ways to find a lot of information about federal court cases. • Check out the published opinions of federal trial and appeals courts on places like Google Books, Internet Archive and HathiTrust Digital Library. Legal Information Institute from Cornell Law School. 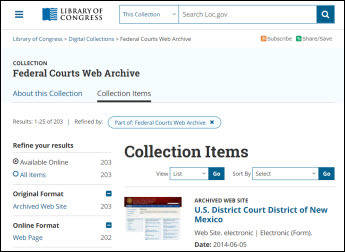 • Make sure to check out all of the resources of the National Archives, where federal court archival records are held, starting with the overview of “Judicial Records” on the Archives’ website. • And don’t forget to check the newspapers of the time and p;lace for clues that your folks may have been involved in a federal court case, even as jurors or witnesses. Indulge that inner law geek… and find out what your folks were up to in federal court. I have a cousin who was murdered in 1915 in Kentucky. There is a murder ballad that was written about her death that my grandparents sang to me when I was just starting out as a genealogist. (I was 13-14 years old.) I have hunted down all kinds of legal documents over the years concerning events leading up to her death. I just found a newspaper article on the case that referenced a case connected to the Federal Court in Greenup County, KY and a newspaper report that he had confessed to her murder on his death bed. Both of which are new information that I found in the last few weeks. I’m still trying to track down the inquest records in Ohio and any newspaper accounts there. Another family were fighting over the rights to a small cabin and piece of land. The information in those depositions and files are simply an absolute windfall. I am compiling a list of court cases that I can sort so I can spend my time at the archives going through old court cases. I don’t want to miss any records! Having court records online would be a bonanza for researchers. Just thinking about it makes me giddy. Did I mention that there is an article about my cousins murder in the Journal of Southern Legal History with my name on it? Richard H. Underwood & Sharon Ray, The Sad, Sad Story of Lula Viers, 15 J. S. Legal Hist. 259 (2007). HE had a small file and a digital recording of the song. I had an expanded briefcase filled with documents, pictures, newspaper articles, etc. stuffed into it. I have found some really interesting things in legal case files. One of my favorite things to do at the archives is to request case file storage boxes and read the other files in the boxes. These files really need to be digitized. Please heed Judy’s advice and use court records. If you live near a law library make a visit, great place to start because there is usually someone who can help you. I have been a fan for decades. Geek, maybe does taking a Leagal Research class at my community college count. Try it. That kind of serendipity happens all the time in genealogy!